Patch 5.5 is on the way and the official patch notes have been posted! Continue reading for the complete notes, including Bard, several new items, balance changes for oodles of tank junglers, upcoming skins, texture rebalances, and more! Toot toot! That's the sound of the patch 5.5 buff barge, sailing the ocean of champion diversity. There were a few we had to slap on the wrist for overstaying their welcome but, for the most part, we've got a lot of +1s on the way. As a caveat, while it might feel great for every patch to be held aboard the S.S. Buff Barge, we're being very conscientious about making the directionally right change for each champion. It's still very, very important for champs to remain strategically unique from one another, so we're always hoping to accentuate strengths (or weaknesses) through each update. So what's our current narrative? For today it's the jungle. We're going to say this up front: we haven't been as communicative on the topic of the jungle as we should have been. Additionally, when we have made changes, we haven't been empathetic to player pain surrounding each patch. With that said, our focus is to increase champion diversity in the jungle. Some of you might be worried about "double dipping" buffs with the new Cinderhulk enchantment combining with tanky jungler buffs, but these are aimed at two separate things. Bami's Cinder (and Cinderhulk) creates a clear mid to end game item for tanky junglers to pursue, while a lot of our champion-specific buffs are aimed at improving the feel of early clears. 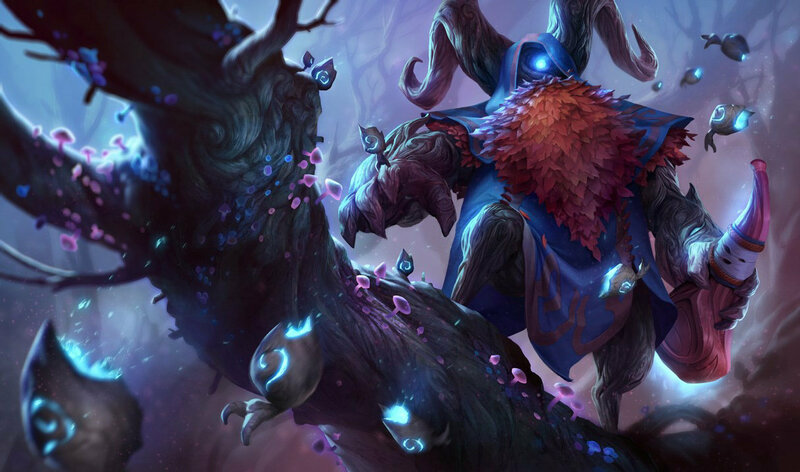 We're a little concerned some tank junglers (looking at you, Sejuani & Amumu) might just start rampaging from the forest, but are taking a more "wait and see" approach for now. You've been warned. But wait there's more! Beyond the jungle, we've also got a new +120 ability power item coming to the game to fill the void left by Deathfire Grasp's departure. There isn't much else we can contextualize in the foreword versus the actual item context, so go read down there. P.S. We're also at the end of the updated Summoner's Rift Beta! While it's hard to define an 'end point' for these things - since we're always going to be iterating - it's nice to put a "finished for now" sticker while we can. We're shipping some final map-wide iterations for Summoner's Rift (and animated end of game victory / defeat graphics! ), so you should expect a hefty download compared to our normal patches. We appreciate all the feedback you've given over this course of time! And that's all for us! We've got a lot of changes packed into this patch, but we hope you'll make it through it. 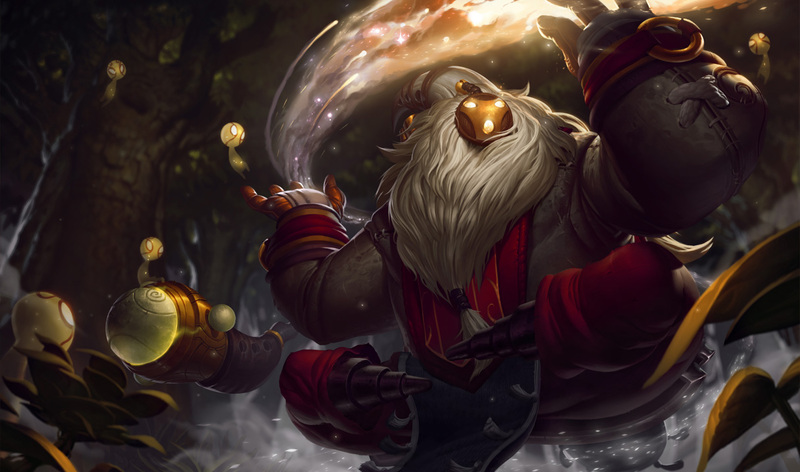 Bard, the Wandering Caretaker, will be released a bit later during Patch 5.5! Increased the range at which soldiers can attack and spears 'pass through' to hit things further. Also base attack speed up. Recent balance changes haven't been kind to Azir, so we're giving the Emperor some love targeted at his early-game feel when it comes to commanding soldiers. While these buffs don't solve all of Azir's problems, strengthening his sustained damage should ensure he isn't totally mummified. Base mana up, damage cap versus monsters also up. While not always thought of primarily as a Jungler, with the Buff Barge 2K15 docking at Jungle Island we thought it'd be a great time to pull back some of Graggy's stat restrictions to help drink Gromp and his friends under the table. R cooldown and mana costs are down, range up slightly. Unlike Riftwalk, we went a little too far last patch. The focus of the changes were to lower the amount of instant mobility Kassadin had access to without changing his long-term movement too dramatically - this patch, we're tuning up his ultimate to put a little spring back into his Riftstep. In all levels of play, Lissandra can be summed up in one word: consistency. In each lane she sees play, her relative safety (thanks to her amazing waveclear) sets her up as a top-tier threat thanks to Frozen Tomb's unforgiving CC. Not wanting to over-do it, we're hitting Ice Shard as a way to tone down her damage, clear (and by extension, safety) all in one go. W damage down, E's cooldown, mana costs, and slow duration are all reduced. By being the cornerstone to both his offensive AND defensive ability, Titan's Wrath forces Nautilus into a playstyle that is very binary - break the shield and he's harmless, or suffer if you fail to do so. Shifting power into Riptide lets him clear faster and take more actions per teamfight, which are two key areas we thought were weighing him down. Trap damage now deals flat magic damage rather than a lower base damage + current health damage. With the introduction of her rework, Bushwhack's current-health paradigm existed to soften up targets for big takedowns and secure vision to play with her new Hunt passive. Now one of the hottest junglers in the scene, it's enabled her to have the fastest clears in the game. For a skill with so many different uses as-is, we're re-balancing the damage so that while still useful with ability power, doesn't trivialize fighting the toughest monsters out there. When looking to punch Shyvana's ticket aboard the Buff Barge, we decided a more general boost to her effectiveness would suffice. Often used for her mixed-damage and innate defensive stats, we like Shy most when she actually has to punch the stuffing out of you to win fights - so that's exactly what we're reinforcing here! It's called "Mega Adhesive," not "Adequate Adhesive." Fling in peace, summoners. Q's mana costs down, ratio slightly up. E's mana costs up at later ranks. When it comes to Super-Tanks in top lane, we actually like what Sion brings to teams and how he interacts with opponents, with the exception of his laning phase - so we're keeping things "power-netural" for the big zombie. Shifting power from screaming at minions to dropping the chopper on frightened opponents means it requires a little more effort to win the wet-noodle-war than just never running out of mana. Q's damage up (hey, it stacks up man), E's damage at later ranks up. You're not the only one that misses your kind, Skarner. Another beneficiary of our focus on jungles this patch, we're aiming to give more damage back to the scorpion, especially in the later-game where his rank-ups can feel relatively poor. For a while we've been normalizing mana costs on ultimates, and Sona's the recipient of the next round. Sona buffs. What a time to be alive. Rapid Fire's cooldown is reduced by 1 second for each basic attack she lands against an Explosive Charge'd champion. When it comes right down to it, hyper-carries amongst marksmen usually care about one thing: basic attacking. As her primary source of damage, Tristana often felt awkward about giving up DPS to cast Explosive Shot, only to have them escape before she could make use of its damage potential. Adding the cooldown incentive should make it up to her, as well as giving her things to do when she's forced to shoot the durdling brawlers and tanks that try to scrap deep behind enemy lines. Passive range upped to match experience range. W's healing amp is now the same at all ranks, and R's been slightly buffed due to a bugfix. What's a Tank to a King? While most of these changes are focused on bugfixes and feel improvements, we felt it wouldn't be fair to address such a large number of tanks and tank-enablers without mentioning their natural predator. Focusing on sustain and regen should let Trundle keep pace with his opponents, biding his time before he goes all-out clubbing and takes their hard-earned stats. Urgot's shield now also scales with total mana, and R's cooldown has been reduced at later levels. Urgot's going to need a lot more under-the-hood work before he can hit the big-time, but in the interim we thought he could use some help. A Mana ratio on W makes his beefy/CDR build more rewarding, keeping him active in sustained fights without adding to his snowball potential once the Acid Hunters set their sights on you. Although he has a dark, secret past, even the buff barge couldn't resist giving some love to League's original scuttle-crab. Cooldown now starts ticking the moment he starts charging. More of a quality of life change, Varus players should feel encouraged to charge their arrows instead of feeling penalized. E's delay before walls appearing has been reduced slightly. Q is around 14% faster! One of the larger themes for his 5.4 update was lowering reliability in favor of creating consistent high moments for master Veigar players. It appears we overshot (not a short joke), so we're dialing back to help Veigar feel less like a sitting duck when it comes to intense situations. Throw in some 'Quality of Doom' changes for Event Horizon, and the tiny master of evil should be turning tables and cackling like a super villain all the way to the nexus. Movement speed down, R damage down at early and mid ranks. Known for punching first (and asking questions while punching), Vi's never been good about giving her opponents much of a chance to fight back. 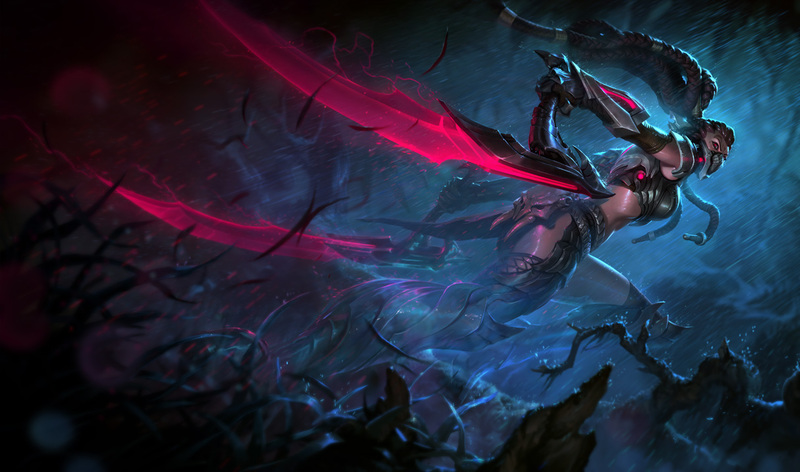 Being one of the toughest champions to peel (combined with devastating ganks) make fighting her feel stacked - so we're draining some power from these areas to even the odds. Bite a monster, get half your cooldown back. Winning! W's base healing up at early levels, E's damage up at later levels. As a jungler on the borderline of viability, we're giving X to the Z a bump towards his strengths (sustain and skirmishing) to help him get down to business. Smoothing out Unstable Matter's CDR mechanic and doubling E's knockup time so Zac players can feel better about doing what they've always done: throw yourself with reckless abandon into the enemy team. SLAM CHUNKPicking up a chunk now briefly gives Zac a "reservoir" of CDR, even if he casts W within the 1 second following pickup of a chunk. As with all changes that both increase complexity and skill-ceiling, Zilean saw a pretty dramatic shift last patch. While we want to give more time for players to learn how to use him effectively, this change enables his Q+W+Q combo that folks are used to. We're continuing our comprehensive pass at the game's older character textures. As with previous installments, our goal is to improve parity with newer releases and make sure everybody looks at home on the newly-updated Rift. Reminder: texture rebalancing isn't meant to replace - and doesn't delay - larger-scale updates! Our new 120 ability power item is here to fill the void left by the passing of Deathfire Grasp (rest in pieces). Goals up front: we want to provide a unique item that helps out movement-focused, spell-slinging mages, like kitey Lux, bursty-train Akali, or even spell-slingy (that's a word) Karthas. Try it out and let us know what combinations work with you - we'll be keeping a close eye here as new experiments get brought out. It's also important to note that this works on spell hits, not basic attacks! UNIQUE PASSIVEGains charges upon moving or casting. At 100 charges, the next spell hit expends all charges to deal 100 (+.15 per level) bonus magic damage to up to 4 targets on hit. Applies spell Effects (e.g., Spell Vamp, Rylai's, etc). When the cooldown on the upgraded red trinket was increased, we missed the fact that the middle tier red trinket now had a lower cooldown than the item it upgraded into. We changed the tooltip last patch and we're making the actual change now. THEATRICSUnskinned Sight and Vision Wards now have spawn and death animations to provide better feedback. Don't get distracted. We've mentioned this before, but one of our goals with this 'new' tanky jungle enchant was to provide an item that not only provides valuable tank stats but also helps junglers with their early to mid game clears. We've had to be very careful in balancing champions with this new item (ie: Amumu and Sejuani probably don't need anything in addition to the new Cinder), but we're excited to see what possibilities emerge. Want to play a tank jungler? GET FIRED. UNIQUE PASSIVEImmolate - Deals 5 (+ 1 per champion level) magic damage to nearby enemies. Deals 50% bonus damage to minions and monsters. Juggernaut has been replaced by Cinderhulk. See above with our point regarding a tanky item that also boosts clear speeds. This is that item all grown up. It's also important to note that +25% bonus health stat. Note it. Appreciate it. UNIQUE PASSIVEImmolate - Deals 16 (+ 1 per champion level) magic damage to nearby enemies. Increases with time in combat up to 24 (+ 1.5 per champion level). Sunfire now builds out of Bami's Cinder instead of Giant's Belt. Just a very small directional change to make Sunfire Cape more focused on wave clearing for tanky dudes. There's a little less health on that build path, but you can get to your area-effect burn a little faster. STATSUnchanged. Just so you know. Since those two item build paths are so situational, we want you to feel better about just sitting on a Raptor Cloak. Now that we think players have good ways to deal with this (see: ability power damage to structures, etc), we're giving it some extra love. Also, please don't build this item against Nasus. Trust us. CASUALTY OF THE RAPTOR CLOAK BUFFS. This item is actually very close to a healthy spot. We're just pushing it a little further so getting it earlier in the game improves its synergy with the new Cinderhulk enchantment. This item seems to actually be in a pretty healthy state. It's good for breaking delayed out sieges against an Anivia or Ziggs, and it's a strong augment to your own siege with a Baron buff. Only calling this out to note that we're still looking if it needs anything for later patches. In other words, we're just talking. Hello, how are you. We're fine. UNCHANGEDUNCHANGED. We just wanted to talk about Banner of Command, man. Inhibitor turrets give reduced gold and no experience. This is going to get a little designer-talkish but here we go: the main advantage of taking down a laser turret is mainly to modify the game state - that is, access to either the inhibitor or nexus. Since taking (or not taking) these turrets are more about access to strategic buildings, the gold they provided acted as more of a "win more" mechanic than an incentive for the opposing team to take action. We're clarifying that! Designer talk over. Laser turrets give reduced gold and no experience. See above! We can copy paste it here, that's okay: this is going to get a little designer-talkish but here we go: the main advantage of taking down a laser turret is mainly to modify the game state - that is, access to either the inhibitor or nexus. Since taking (or not taking) these turrets are more about access to strategic buildings, the gold they provided acted as more of a "win more" mechanic than an incentive for the opposing team to take action. We're clarifying that! Designer talk over. Middle lane inner turrets no longer have a shielding mechanic. Top and bottom lane turrets shield for less, but all turrets have more health. The goal of turret shields has always been to mitigate the oppressiveness of poke-heavy teams when they hit their stride. That said, the shields are a little too weighted in favor of the defending team, and we're seeing common stallouts on mid-lane inner turrets. With this change, we still want to reward split pushing and smart map rotations as counters to stall-focused teams, but we're reducing a little strength here so they're not just artificially drawing out games. Minions got healthier, but turrets still do the same damage to them. The unsung hero of sieging in League of Legends: minions. That said, they're currently not living up to their full potential and are getting washed out before any meaningful sieging can be done. Realizing this, we sent the minions to the gym so they'll be a little more resilient when marching down the lane. Our goal wasn't to affect last-hitting under turrets (hence the weird turret damage upgrade), but a bug made the timing slip by about 1.5 minutes. In other words, from 9:00 to 10:30, when you're last hitting minions under the turret, melee minions will have 6 more health when in "last hit" range (ie: after two turret shots), caster minions will have 3 more health (after one turret shot), and siege minions will have 9 more health. Some of the inequalities between camp camps were a bit too pronounced, with some jungle routes being much, much better than others. Since one of our goals with the 2015 season was to ensure there wasn't a single best path for the jungle, but that junglers had to modify their clears (and jungle buffs) according to the pace of the game, we're adjusting. TLDR: Making camps easier. Say that three times fast. Gromp buff now scales with bonus health so jungle tanks can scale better in their jungle clears, even without Cinderhulk. This includes all other things considered 'pets,' so Tibbers, Voidlings, and even clones. It's technically a Shaco buff too, which is concerning. Counts buffs, not kills. Also glows when a team hits 5 stacks. Very exciting. Patch 5.5 marks the end of the Summoner's Rift Beta we launched last November! We're celebrating this milestone with a comprehensive colors pass and the animated Victory/Defeat screens we teased back in our beta announcement video. Though the beta has come to an end, we're continuing to look for opportunities to update the rift. We really appreciate all the feedback you've given us and hope that, together, we've made Summoner's Rift a place you want to spend your game time in. We've heard a lot of player feedback around the art style of the updated Rift: many of you feel the new map is less vivid and lively than the original. We've been working on a comprehensive pass to bring back some of the vibrance of the old Summoner's Rift without sacrificing the clarity and readability the update offers. MAP DETAILSMore have been added to help anchor your champion on the map, similar to how each quadrant of the jungle has a distinct feel. We also added a duck, but he's pretty noncommittal so you might not see him too frequently. Looks cool but we ran into technical issues when we launched the beta, so we decided to ship without them. That's…about all the context we have. We're making a change to the landing page which'll allow you to read news articles in-client instead of being linked out to your web browser. We've got a bit more testing to do following the release of patch 5.5 so this won't be active right off the bat, but look for this quality-of-life improvement in the weeks to come! Here's a brief look at a few of the new things included in patch 5.5, including things mentioned above in the patch notes and things discovered during the last PBE cycle! Most of this coverage includes preview screen shots and video taken during the 5.5 PBE cycle and may vary from what is pushed to live. Most notably, patch 5.5 includes our newest champion Bard, the Wandering Caretaker! For more on his kit and abilities, check out our PBE coverage! Check out these links for more information on BARD! 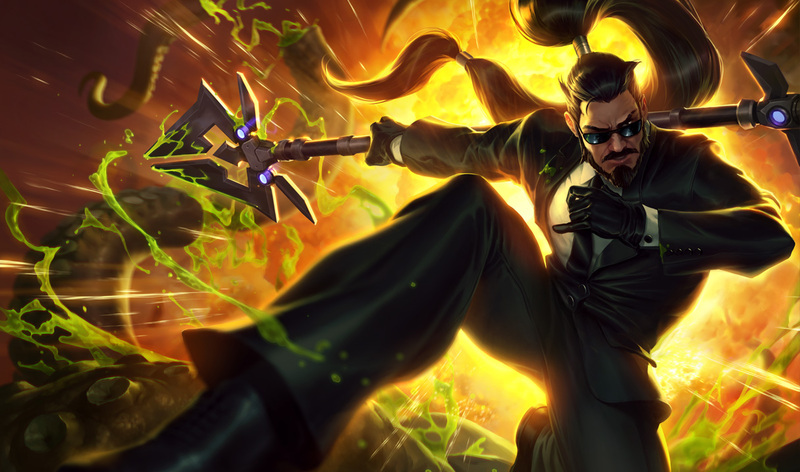 Patch 5.4 includes two new champion skins - Headhunter Akali and Secret Agent Xin Zhao. These will be out some point after 5.5 goes to live and we'll have a full preview posts when they are released! As mentioned above, Kassadin has received a slew of visual updates in 5.5! Also included are updates to his visual effects, anomations, and a new set of ability icons! 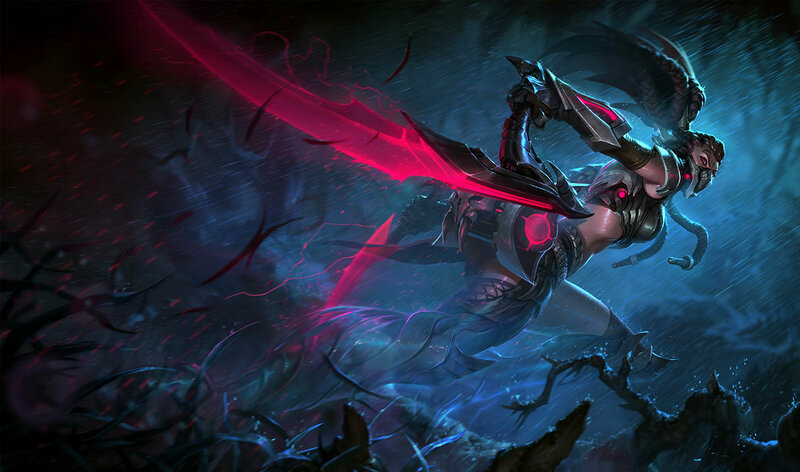 This patch includes texture rebalances for Taric, Warwick, Janna, and Cho'Gath! These texture adjustments are meant to align older champions with the current art style. They are not meant to replace full visual updates. More screen shots and side by side comparisons of Taric's updated skins can be found here. More screen shots and side by side comparisons of Warwick's updated skins can be found here. More screen shots and side by side comparisons of Janna's updated skins can be found here. More screen shots and side by side comparisons of Cho'Gath's updated skins can be found here. Luden's Echo has been added to the game! Click here for a VFX preview video. Base Stealth and Vision wards now have their own set of animations! Updates to the end of game victory / defeat animations! Along with the other SRU tweaks, Dragon's pit now has a appropriately dragon-y symbol.